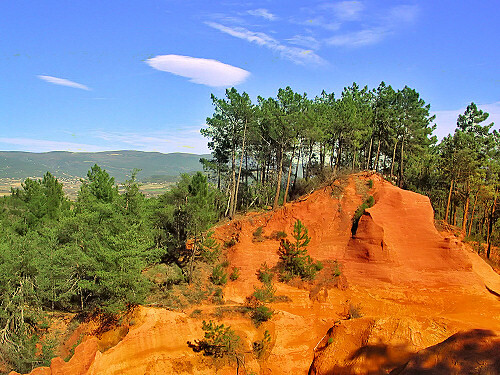 One of my favorite places that I visited in Provence was Roussillon. I had never heard of the place, so I wasn't prepared for how overwhelmed I was by the beauty of an entire village colored by the dirt around it. This small village, population about 1,300, is built on top of a steep-sided mountain of ochre. The buildings blended right in with the countryside around it. The colors of ochre range from yellow to orange and red. 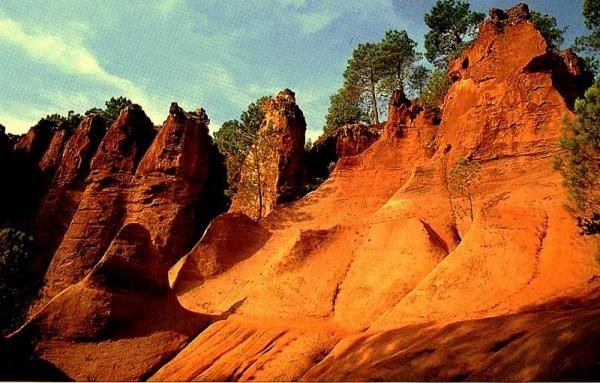 Large quarries were established in the late 1700s because the ochre was used as pigments in the textile industry. The deposits had been mined by the Romans since the time they ruled the area, but the quarries were shut down in the last century and the deposits are now protected and no mining is allowed. Since it is a hill top village, it was interesting to look over the walled edges to see the bright rust-colored cliffs and pretty little farms below. The combination of the ochre-colored dirt and the green crops and trees was beautiful. But what I really loved best was walking through the town and enjoying the wonderful old buildings. Many were made of cut stones in shades of beige, tan, orange, or rust held together with mortar of another shade provided by the ochre. Or if the buildings were plastered, they were painted in a shade of ochre. From a distance, the buildings almost look like they are piled one on top of another. But once we entered the village, we realized that there are interesting little roads, alleyways, and paths that weave between and around and even under the buildings. We just picked a road at random and started following it. The village is too small to get seriously lost. Sometimes we might come to a dead end, but we'd just turn around and follow another road which might suddenly round a bend to reveal a lovely little plaza with small shops offering flowers or wine or art supplies. The plazas were all dotted with restaurants that had a kitchen and a few tables inside with the preferred seating outdoors under umbrellas and surrounded by pots of herbs and flowers. I couldn't resist buying a box of pastels of the "local colors" of Roussillon. It's been nine years and I still haven't used them. They are too beautiful to mess them up! 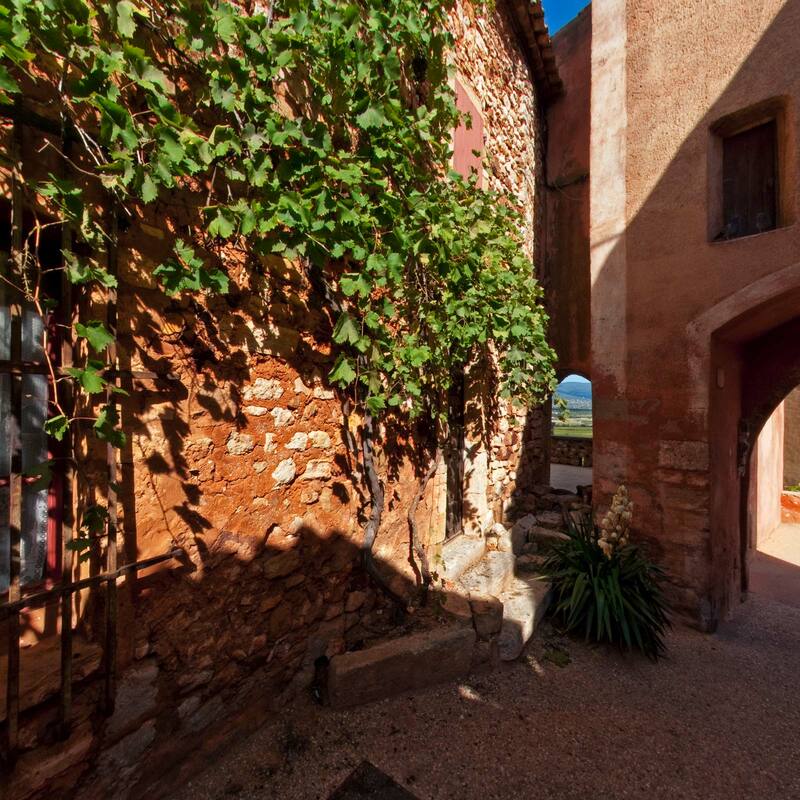 Maybe this post will encourage me to use them for some drawings of Roussillon.